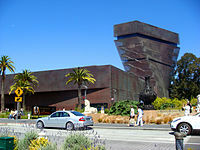 English: The De Young Museum — a fine arts museum on the Concourse in Golden Gate Park, San Francisco, California. The building was designed by architects Herzog & de Meuron, and is part of the Fine Arts Museums of San Francisco. Pages in category "De Young Museum"
Media in category "De Young Museum"